What kind of maintenance is required and how often to keep embroidery lasers performing at peak capacity? 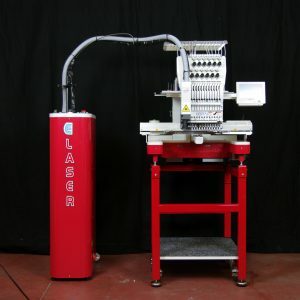 For singlehead embroidery lasers, I recommend daily cleaning and lubrication of the embroidery machine’s hook. 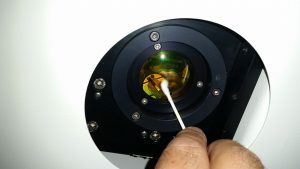 On the laser itself, you should clean the optical lens daily. Simply use a cotton swab with alcohol and gently wipe it clean. It is easy to reach. Not performing daily maintenance will reduce the life of the lens as well as weaken its performance. A clouded lens blocks the cutting beam. For a multihead laser bridge machine, the daily maintenance is the same. There’s more periodic maintenance on a laser bridge because it does a lot more cutting. You want to check once a week that the vacuum lines are nice and clean. Another area to check is all vent opening and filters for the electronics and cooling fans. Keep these clean so air is not blocked. The system is self-lubricating so no need for oiling. Your electronic boards do not need maintenance, but if you ever are having an issue, it should be one of the first places to check. In this video you are seeing a Proel LaserBridge machine built over a Happy six-head embroidery machine. This job has two layers of satin: black on top and red on the bottom. At the beginning of the video, boxes had already been stitched onto the fabric. The laser then cut a square out of each box allowing the red background to come through. This technique is called reverse appliqué. Proel TSI and BITO USA were at the TexProcess show, May 9-12, 2017 in Frankfurt, Germany. This is an international trade fair for processing textile and flexible materials. 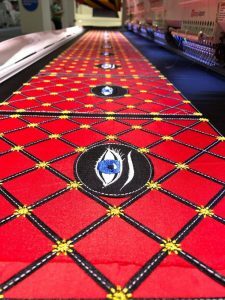 The Proel LaserBridge machine was mounted over a Happy six-head embroidery machine and was in action during the show showing off its capabilities and potential. In this series of four videos, you can see how it’s possible to create innovative, unique, home decorative accessories and fashion apparel that cannot be matched without the smooth, seamless productivity of a laser embroidery machine. This particular job was a window treatment. For more information, contact BITO USA at 866-BITO-USA (866-248-6872); email: bito@bitousa.com or visit the website at www.bitousa.com. In this video, you are seeing a Proel LaserBridge machine built over a Happy six-head laser embroidery machine. The job has two layers of satin: black on top and red on the bottom. At the beginning of the video, boxes had already been stitched onto the fabric. The laser then cut a square out of each box allowing the red background to come through. Part two of this video series of the Proel LaserBridge shows that a yellow sun has been embroidered at each corner of every box. Then the laser cuts out a circle in the center of the piece. The black fabric is weeded showing the red satin underneath and a woman’s eye is embroidered in the center. 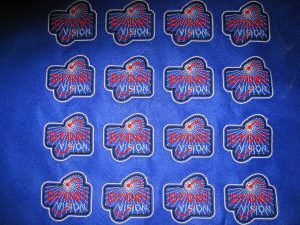 In this video, you see the laser move from embroidery head to head and quickly cut the top layer of fabric to reveal the red layer underneath. Cut pieces are quickly and easily weeded from the design. Here, you see the finished product, which combines embroidery with laser cutting to create an eye-catching piece. Printwear Magazine offers a tip from Ed Balady on how to ensure the delivery of your new laser embroidery machine goes smoothly and efficiently.